Most computer manufacturers, particularly the larger vendors, take a “one size fits all” approach to supporting their customers. Although it may seem that they are focused on your industry’s needs, if you were to ever have a problem with your system, you will quickly find that you are on your own. 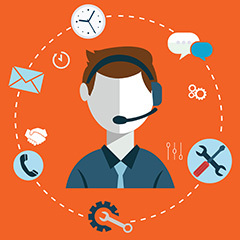 Try calling the support line at any of the big name workstation or server vendors, and you are likely to speak with someone in a call center who has no familiarity with your particular application or industry, such as graphics for live broadcasting, high-speed network testing, or medical imaging. At NextComputing, we do things differently. Our focus is on the needs of users in specialized industries. We work directly with our customers every day to ensure that our computers meet their unique requirements. Our support of your OEM product goes beyond our hardware. We know complex interactions between custom software and hardware can be a time consuming, expensive use of your valuable resources. Working with NextComputing you have a true partner to help you with optimizing and troubleshooting your appliance. This starts with your first prototype system and can extend for years to come as you deploy systems to customers and update your software and hardware configurations. Our engineers will work with you directly to understand how your software runs on our systems. If there is ever an issue you can be assured that we are working with you on your level to provide a solution, and not starting from scratch. It’s like hiring an additional engineer to assist with your application, without any additional cost. Try getting that kind of service from the big guys! Contact a NextComputing Sales Engineer to discuss our personalized support capabilities.